Cooling substances used in air conditioners have a serious climate impact. The Empire State is on a tear when it comes to tackling climate change. On Monday, as the mayor of New York City was calling on cities around the globe to divest their assets from fossil fuels, Governor Andrew Cuomo directed the state to phase out a potent greenhouse gas the Trump administration is ignoring. From 2020-2024, New York will implement a phase-out of hydrofluorocarbons (HFCs), chemicals the cooling industry adopted widely in the 1990s as a replacement to chlorofluorocarbons, which were eating a terrifyingly large hole in the ozone layer. While HFCs don’t destroy ozone, they happen to be a serious climate pollutant with about 1,000 times the global warming potential of carbon dioxide. New York’s plan to phase them out is a step toward the state’s goal of reducing its total greenhouse gas emissions 40 percent by 2030. “While the Trump administration denies climate change and rolls back efforts to protect our planet, New York is picking up the mantle of climate leadership and forging a path forward,” Governor Cuomo said in a statement. To accomplish the phase-out—which would affect new and retrofitted equipment from light duty vehicle air conditioners to refrigerators—the state will closely follow Obama-era updates to the Environmental Protection Agency’s Significant New Alternatives Policy that limited HFC use where safe alternatives are available. 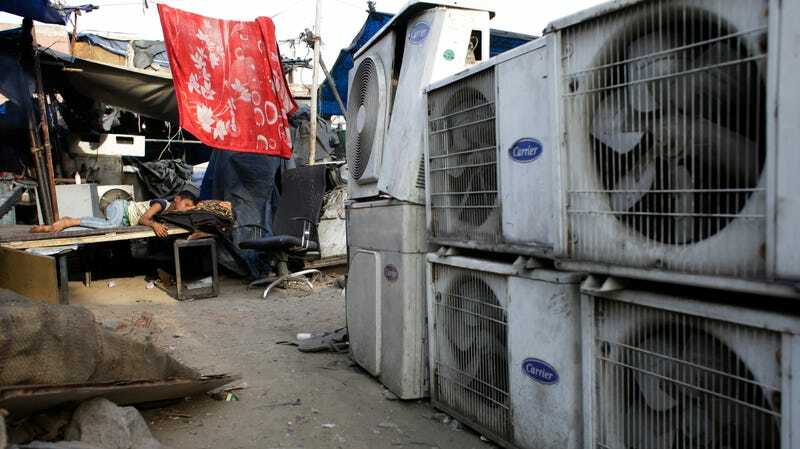 Those rules would have helped steer the U.S. toward compliance with the Kigali Amendment, a global agreement to phase out HFCs that was negotiated in late 2016. The amendment was expected to stave off up to half a degree of global warming. In April, now-vanquished EPA leader Scott Pruitt decided the agency would no longer enforce the Obama-era rules at all. And although business leaders and even Senate Republicans have urged President Trump to send the Kigali Amendment to Congress for ratification, there’s no sign of that happening anytime soon. Now, New York state aims to steer the cooling industry toward more climate-friendly alternatives to HFCs without federal aid. It’s not alone: California also has a policy on the books requiring the phase-out of these substances, and Cuomo is urging other states to jump on the bandwagon. In the climate policy world, HFCs are low hanging fruit. Perhaps there’s hope yet they can be eliminated. Why Is an Ozone-Destroying Chemical Coming Back, and How Do We Stop It?